During this fast-tracked project, the design team learned that the owner hadn’t selected a furniture or equipment vendor due to rapidly changing technology needs. Since telecom and AV for classrooms would be specific to the furniture vendor, the team guided UCI through the procurement process and coordinated all furniture and workstations. This painstaking process and preparation of detailed layout drawings was coordinated on a floor-by-floor basis to suit specific user needs. The late addition of a retail café after the second level PT deck had been placed was another challenge. The team worked closely with the owner, the food service provider and campus health department to execute construction within a matter of weeks. The University Extension Classroom Building provides an immersive education experience that coalesces UNEX’s vast array of intellectual content and digital communications with onsite learning. The sequence of gathering spaces and interaction nodes are interconnected by clear internal and external pathways nested into the hillside topography, reinforcing architectural porosity and connections to the campus landscape. 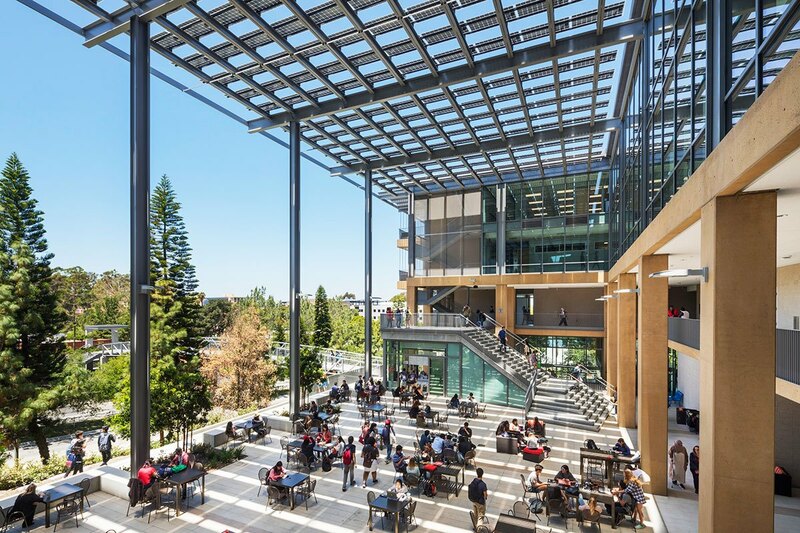 The external architectural expression further supports the program goals by providing a distinctive, welcoming presence that embodies Extension’s academic mission.